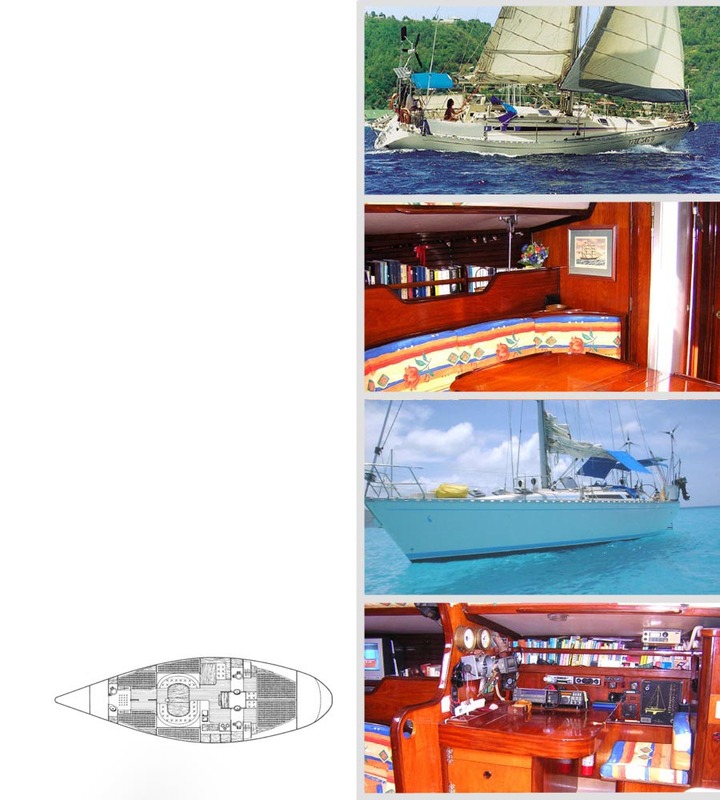 be able to know the best anchorages and fully enjoy the life on board. you'll surprise with her Italian cuisine. The First 47 is an elegant and fast 47 feet designed by German Frers expressly for charter and built by Beneteau. All internal furniture are in wood teak. We have two twin cabins with King size bed, each with own bathroom with shower. A large living room with two curved settees for ten people and a separated galley with stove and oven, the navigation station and forward two double cabins with two single berths each with one bathroom and a shower. A spacious flush deck is perfect for the life in open air. Starting from south, he embarkation point will be in the port of St. George, Grenada. This fascinating island is called Spice Island for its production of nutmeg, cinnamon and cocoa and the symbols of these spices are actually represented in the national flag. With its cheerful and friendly inhabitants, its luxuriant vegetation, its fragrances and color, Grenada is one of the islands that best preserve and express the nature of the Caribbean. From here we will set sail for CARIACOU which we will reach after a most delightful navigation following the Trade winds and with the forest along Grenada's north-west coast and Ronde Island as our backdrop. Level with Scarborough, the island's capital, we will cast anchor in one of those little jewels of a place called SANDY ISLAND - surrounded by the finest coral beaches of an immaculate whiteness that gives the water its particular turquoise color. Leaving Cariacou behind us, we will sail to UNION ISLAND which, with its cheerful confusion of little bazaars and pleasant restaurants, is the perfect place to spend a lovely evening to the rhythm of steel bands. Proceeding northwards, we will find the more tranquil and solitary MAYEREAU with her "half-moon beach" and little church on a hill from which one can enjoy a breathtaking view of the Tobago Cays barrier reef. Leaving Mayereau, we will reach TOBAGO CAYS. This is one of the most beautiful and evocative anchorages in the world: three little islands enclosed by a barrier reef in the shape of a horseshoe in the shelter of which we will cast anchor facing the ocean and its majestic waves. Tobago Cays is a nature park and its waters offer the chance to plunge oneself into an incredible, natural aquarium two to three meters deep. A few miles further south we will find PALM ISLAND and then the restful and exclusive PETIT ST. VINCENT surrounded by the whitest of beaches. Opposite, and separated by a small stretch of sea, lies PETIT MARTINIQUE, the smugglers' island. From here we will return to Grenada, our disembarkation port, where it will be possible to organize a minibus trip at will to visit the island's interior with its waterfalls, rainforest, rum distilleries and spice factories or go diving with a guide to look at the wreck of the passenger ship "Bianca Costa" which sank just off Grand Anse beach. (Excursions are not included in the price of the cruise).